It was SO much fun hosting the facebook LIVE Art of Eating MASTERCLASS! We covered SO MANY amazing tips and tricks and if you missed it, the replay can be found below! I also launched my upcoming 28 day "Be the Whole You" jumpstart program - and you can find out all about it in the replay of the video! It a 4 week online group coaching program which begins on May 13th that is going to TRANSFORM your life. I wanted to now ask you this..
Have you ever felt pushed into dieting? Have you ever felt like it was your only way out of your weight loss struggle? It’s ok, I’ve been there. Good news is, I’ve unlocked the secret to ending the diet rollercoaster, and you can still lose weight (just like I did!). You’ve got to put yourself first and start taking care of your body. Putting yourself on these diet crazes are only depriving your body, and you know what happens after that – binge eating. It happens all too often when you deprive your body eventually you’ll try to play catch up and indulge in treats to satisfy all those times you couldn’t have one. But, imagine if you knew how to feed your body and you never felt deprived? Imagine if you indulged in delicious food and wouldn’t make you gain weight. Imagine if you could achieve the body of your dreams without starving yourself, or taking diet pills (or shakes!). It can happen. It can happen with a whole food lifestyle that focuses on plants, taking care of yourself, learning to love your body and finding what truly nourishes you from within. I know you have tried tons of programs, diets and meal plans. Some may have worked, and some have left you feeling skeptical. The truth is I can’t give you all the answers, but I can help you figure out how your body ticks to start making a change. Read more about the program here. Are you ready to find out what’s included in the program? Read on, gorgeous. LIFETIME ACCESS to all materials on a password protected platform. Weekly LIVE training coaching calls that are all pre recorded so you can access them anytime, anywhere. Make sure to LOCK IN the early bird rate now as this program is normally $427! Then don't waste another minute, Break free from the diets, unlock your unique wellness blueprint and discover food freedom! If you aren't sure, just shoot me a reply back to this email and I can answer any of your questions. Don’t miss out: claim the body and health YOU so much deserve! 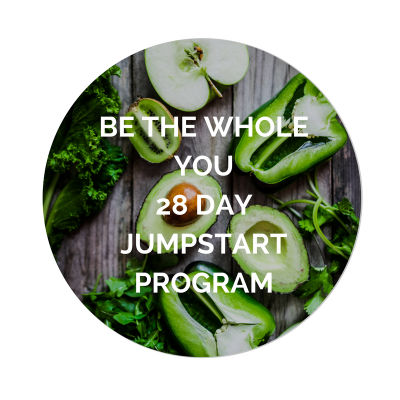 Join the 28 day Be the Whole You Jumpstart for a SPECIAL PRICE today! Looking forward to guiding you toward better health!